Maine Audubon has assembled a new Loon Kit with funding from the Maine Outdoor Heritage Grant Fund. The kit is available for free loan for school teachers, lake associations, summer camps, scout groups and others who would like to teach children about loons. 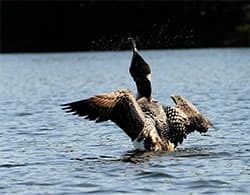 The kit includes an actual loon study skin, real loon egg, skull, wing and bones; along with a CD of loon calls and a variety of books, posters and publications about loons. To reserve a Loon Kit from the Maine Department of Inland Fisheries and Wildlife, please contact Lisa Kane at Lisa.Kane@maine.gov. The kit must be picked up from and returned to the Augusta office. Generally, kits are loaned for a week at a time.